Jesse Jenkins and Nestor Sepulveda of MIT discuss what the future looks like for reducing CO2 emissions in electricity. Francesca: From MIT, this is the Energy Initiative. I’m Francesca McCaffrey. On today’s show, we talk to Jesse Jenkins and PhD candidate Nestor Sepulveda of the Electric Power Systems Center at the Energy Initiative. Jesse and Nestor tell us about what the future looks like for reducing CO2 emissions in electricity, and talk about the importance of what they call firm low-carbon resources. We also talk about promising types of energy sources, and why current policies might not be supporting the full suite of resources needed to get to a carbon-free grid. Jesse and Nestor, welcome to the show. Jesse: Thanks for having us. Nestor: Hi Francesca, thanks for having us, it’s great to be here. Francesca: So, you two have a new paper coming out. Can you tell us a little bit about it? Nestor: Yeah, so, we have this paper titled “The role of firm low-carbon electricity resources in deep decarbonization of power generation”. The paper was co-authored by myself, Jesse here, Dr. Fernando de Sisternes, and professor Richard Lester. Jesse: The focus of this paper is really on exploring the different combinations of low-carbon energy resources that we need to affordably reach a zero-carbon electricity supply. We look at a bunch of different combinations of available resources under a wide range of uncertainties and try to extract some robust insights and findings from that wide-ranging uncertainty analysis. Francesca: Why did you decide to write about this topic? What about it is important for people to know? Nestor: I was doing a Master’s in Nuclear Science and Engineering here at MIT in the Technology and Policy Program, something that Jesse and I share in our backgrounds. I had this question. Actually, one of my professors, we were talking about how you decarbonize power systems, and we were wondering how you actually determine what will be the most beneficial way of doing it. The way that will maximize social welfare. That’s how I ended up building on this for my Master’s thesis. Then, at some point, after I was done, Jesse and I were talking about the findings and we decided to move this forward, improve the experimental design, take a closer look at the assumptions that I was making, and we came up with this topic. Jesse: Yeah, what really drew me to Nestor’s findings and to the idea of expanding it into a broader paper, was that he was exploring the potential role of nuclear power amongst the overall low-carbon mix. And this is at a time when we only had four nuclear power plants under construction in the United States, and they were facing setback after setback and cost overruns that eventually led to the bankruptcy of Westinghouse, the cancelling of two of those plants, two of those reactors. The final two are still under limbo and waiting a final decision right now. And at a time when wind and solar were getting increasingly cheap and competitive. Despite that, across the wide range of different tests that Nestor ran, he kept seeing nuclear energy show up in the final mix. That raised, for me, a question of, what’s going on here? Is this specific technology something that’s essential? Or is nuclear an example of a broader class of low-carbon energy resources that we might need to get to a zero-carbon grid, and to complement wind, solar, and batteries, like lithium-ion batteries. So we designed a broader experiment and worked on it together to really look at the role of what eventually we dubbed “firm low-carbon energy resources.” Which include nuclear power, but is really a much broader category. We find that, in this study, it’s not just nuclear, nuclear in fact gets substituted out for other firm technologies. But that there’s always one or more resources playing the firm low-carbon energy role in a zero-carbon grid when we look at the least-cost mix of resources that we could use to get there. Jesse: Firm resources, which is really the focus of this paper, are technologies that can supply electricity reliably, on demand, and sustain that output for weeks or months at a time. These are really the reliable backbone of an electricity system. In today’s power system, that role is filled primarily by fossil fuels, by coal and natural gas-fired powered power plants. In a zero-carbon power system, the challenge is to replace those technologies with other firm resources that can supply that reliability and pair with variable renewable resources like wind and solar, with energy storage, demand-side flexibility, and other resources. But to do so without CO2 emissions. That includes technologies like nuclear power, carbon capture and storage, which could enable us to continue using fossil fuels but capture and permanently store the CO2 emissions. And potentially biomass, if we can harvest it at a sustainable scale or in a sustainable manner. And also other technologies that are at an earlier stage, like engineered geothermal energy systems, which would be a way to tap into hot rocks deep below the earth and harness that energy to produce steam and electricity across a wider area of the world. Francesca: Can you describe the three different categories of low-carbon energy technologies you think that we need to focus on specifically? Jesse: In our paper we present a new taxonomy to think about the role of different resources in the electricity system, in a low-carbon context, especially. Those three categories are, first, the firm low-carbon resources that we just talked about, which provide reliability and can reliably meet electricity demand at different times of the year. Then we have fuel-saving variable renewable resources, like wind and solar energy, which are variable throughout different time scales, from hours to days to seasons. But when they are available, they’re very affordable, and can help displace the use of other resources that consume fuel at a higher cost. So we dubbed them “fuel-saving resources,” because they help back off or reduce the consumption of fuels and other variable costs associated with those other resources in the mix. Then the final category is what we call “fast-burst resources.” These are technologies like energy storage batteries, demand flexibility, so moving around our consumption in time, or reduction of demand or demand response or curtailment when prices go very high, we might want to consume less in those periods for short periods of time. All those technologies are very well-suited to providing fast or quick bursts of power, but not sustaining them over a long period of time. They provide high-value flexibility at the times that it’s most important and most valuable, but we can’t rely on them to sustain that output over long periods of time. That’s a role best suited for firm resources. Nestor: One of our findings in the paper is that we see that these three different resources play a very distinct role in the mix. One of the most important findings of the paper is that even if you might be able to fulfill demand, and subject to constraining emissions, without one of these particular type of resources, the cost and uncertainty faced in order to get to that point is going to go higher. It would be like trying to play soccer with just a goalkeeper and the defenses without the midfielders. Why would you do that if you have this particular set of people or participants that are trained? They know how to play their role. Francesca: Are all of these technologies supported by current policies? Or are there some that need more support due to short-term tradeoffs for long-term gains? Jesse: That’s a great question. In the near term, at the moment, what we’re primarily supporting are wind and solar energy. So, renewable resources. And in some contexts, demand response or flexibility in energy storage. The fuel-saving resources and the fast-burst resources. Two of the three key parts of the team. But in a lot of contexts, we’re not seeing as large-scale support for firm low-carbon resources. That’s largely because each of them face very clear near-term challenges. Nuclear power plants have become very large and very complex and difficult to construct, particularly in the west where we’re not so experienced at building large-scale infrastructure projects anymore. We’ve seen cost overruns and delays and bankruptcies that have plagued construction of nuclear power plants in that context. As I mentioned, biomass has some sustainability concerns. If we’re using land that could otherwise be used to grow food, to grow bioenergy crops, or we’re harvesting forests instead of leaving them to absorb CO2, all of those have important conservation and sustainability and even carbon implications that mean we may not be able to harvest biomass at the scale that we would want to if those concerns weren’t present. Carbon capture and storage also is at a fairly early stage, in terms of scaling up and improving the cost of the technology, and has really kind of flat lined in terms of global progress over the last few years. As I mentioned, enhanced geothermal energy is really at a demonstration stage as well. These are technologies that look today quite challenging, especially compared to wind, solar, and maybe batteries, lithium-ion batteries, which have all fallen in price dramatically in the last few years. Prices for wind, solar PV, and lithium-ion batteries have all come down in cost by about 70 to 80% just since 2009. That’s really amazing progress. And these technologies really have the tailwinds behind them and are also therefore receiving a lot of support from policymakers, from corporate procurement, and elsewhere. While the other technologies, the firm low-carbon resources, appear more challenging, and for that reason, maybe have not received the kind of public policy support that we might need. And the challenge is that if we don’t support them now, in the near-term, they may not be available at the kind of cost or performance that we’ll need in the longer term to get all the way to zero-carbon. That’s why we think this research is so important now, to try to raise and explain the role of these low-carbon resources in getting to a fully decarbonized, affordable electricity supply. Nestor: We see today a lot of support, as Jesse was saying, but this support is usually designed to be technology-specific. Many times, people connect supporting one type of technology, sometimes like variable renewable technologies, solar and wind. They tend to connect that to decarbonizing and they are not necessarily the same. Actually, one of the different points that we have shown in this paper is that, at some point, you might be increasing the share of variable renewables, but you might not be reducing emissions as you like to. That’s basically what drives the other costs in achieving a system that is very, very, low-carbon without having firm resources. What we need today is a set of policy support measures that go for zero-carbon technologies. Because we might analyze some technologies, but we don’t know what we don’t know. It might be that if you implement something that is aiming for zero-carbon, some other technology that we haven’t even spoken about will come up. Jesse: That’s one of the reasons that we focused so extensively on uncertainty analysis in this paper. We model almost 1,000 different combinations of technology assumptions, about what their cost or availability, and combinations thereof. We model two different regions with very different climate patterns and demand profiles in wind and solar availability. And we model a range of different emissions limits to see what happens as we tighten the CO2 limits towards zero, towards full decarbonization of the power grid. What we find is that the things that are robust are the sort of role of individual categories of resources, but not individual technologies. We see very large ranges of variability in the outputs for the energy share that nuclear power or wind or solar might play in the final energy mix. What we do see are robust role for firm low-carbon resources for some combination of wind and solar as fuel-saving resources, and for some combination of energy storage or demand flexibility as fast-burst resources. We really need to think about, as Nestor said, focusing on ends, not means. And focusing on the class of resources within the power system, or the midfielders and defenders and strikers on your team, rather than really focusing solely on means or specific technologies. 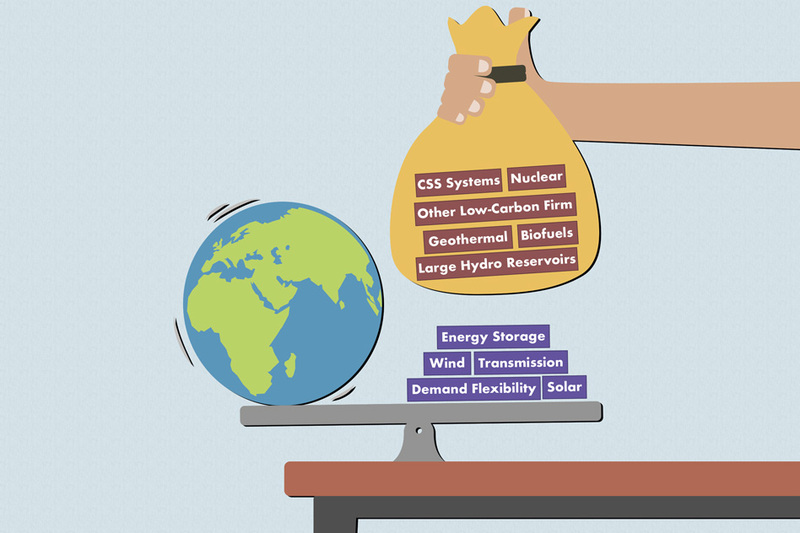 Francesca: What are some of the common misconceptions about firm low-carbon energy resources? Jesse: I think one of the main misconceptions, which is what we’re trying to address, largely, with this paper, is that firm low-carbon resources are optional. That they can be substituted for by a combination of increasingly cheap wind, solar, and batteries. I think those of us who follow the energy or electricity space have probably read a dozen headlines in the last few years about how cheap batteries are the holy grail for variable renewable resources for wind and solar. If we can store the energy from wind and solar, then the variability doesn’t really matter anymore and we can rely on these resources to play a dominant role in the electricity mix, and therefore don’t need to tackle the challenges associated with trying to scale up nuclear or geothermal or biomass or carbon capture. What we show in the paper is that they’re really not substitutes. That wind and solar, as fuel-saving resources, and energy storage as a fast-burst resource, they’re weak substitutes at best for firm resources. And if we try to make them play roles that they’re not well-suited for in the energy mix, we try to make our defenders play offense, you can do it, technically, we find feasible solutions, but it’s much more challenging and much more costly than if we harness firm low-carbon resources as well. Nestor: I think that one of the most important misconceptions, in general, about this topic, is that, so most people think that storage will solve our problems, or that demand flexibility will solve our problems. They tend to think about that in terms of getting rid of low-carbon firm resources. But, in reality, what happens is, if I can make the system operate better, more efficiently, with demand flexibility or storage, I can do the same with firm resources. Our results show that it’s not that you get some value from demand flexibility or storage only when firm resources are not there. You get value out of them when firm resources are there as well. In some cases, you might get even more value than if you only have solar, wind, and storage. I think one of the most striking points, or findings, for me at least, was, we did this case, when we interconnected these two systems, we gave the system a free connection capacity. Actually, we saw that, in the case of firm resources, we also saw a lot of benefit for the system to be connected, but then the extent to which we could increase the connection capacity, that was providing less value, as opposed to a case when you only have solar, wind, and storage. And that tells you something. That tells you, you get benefits from all of these different other resources when you don’t have firm, and you get these benefits as well when you do have firm. In some cases, it’s even greater. Jesse: I think one of the other main misconceptions out there is that technologies like wind and solar that are getting incredibly cheap, they have a low what’s called “levelized cost” of energy. Which is basically a measure of the average revenue that they would have to earn per megawatt hour or kilowatt hour of electricity they produce over their lifetime to pay off all their costs. Both the upfront cost and the cost of debt and equity finance to pay for that, plus any ongoing operation and maintenance costs. What we show in this paper, again, is because they play different roles, they deliver different value. Comparing the cost of wind to solar to nuclear to carbon capture is a little bit like comparing the cost of a banana and a hamburger when you go to the grocery store and try to decide what you want to eat that night. Cost is important, you want to know that when you’re deciding what to buy, but they’re not really direct substitutes for one another, so you’re not going to say, “I’m only buying bananas because bananas are cheaper than burgers.” You want a balanced diet, you don’t want to eat too many burgers, you don’t want to only eat bananas. So, again, these costs are important, but they only tell us half the story. They don’t tell us about the value that each electricity resource plays in the power system, and they don’t tell us about the distinct and complementary roles that they play. And that’s where the kind of system modeling that we do, where we look at the whole power system and how it evolves over time, is really important, because you can see that kind of complementarity and interaction between different technologies. Francesca: Which parts of this paper would be considered controversial in the energy community, or are there several parts that are widely agreed upon that you would like to touch on? Nestor: Two things. On one side, I would say that the results that we see with demand flexibility, most people tend to think that the resources that benefit the most from having flexible demand are variable renewables. We actually see that, in cases with firm resources, low-carbon firm resources, the cases with the demand flexibility resource is used the most. So basically, we actually see that these firm resources are operated in a more efficient way when demand is more flexible. And so I think that that might be counter-intuitive for some people. And then, well, the point that, we see these resources, low-carbon firm, making a difference in every single case. I think it’s also controversial. Because I do think that some people think that if you could get rid of these resources and at some point, at some cost, you will not have a difference, but we don’t see that. Jesse: Across the literature, I think, in the last several years, we’ve seen some consensus points start to emerge. Even just since we started the various iterations of this paper and worked its way through the peer-review process, we’ve seen several complementary papers come out in recent years as well. Which, I think, are starting to form a consensus that moving to a zero-carbon grid, primarily dependent on variable renewables, wind and solar chiefly, is much more challenging than getting to more an intermediate emissions reductions with wind and solar. What I think we’re showing in our paper, and what a number of other recent papers have also demonstrated, is that there’s sort of an exponentially increasing challenge as you try to push further than 80% wind and solar to get to zero carbon. What I start to see emerge from some folks in the public discussion is this idea that, if it gets challenging to move beyond 80% renewables, we should commit now to 80% renewables, push wind and solar to that point, and then that will buy us 10 or 15 years. Then when we get there, we can figure out how to solve the remaining 20%. And it’s just 20%. We’re almost there. I think that mentality is a little bit risky. Because, first of all, the final 20% may be half the effort, because it gets more and more challenging as we go, trying to ring the last bits of carbon out of the grid. So thinking of it as “just the last 20%” is probably a little bit of a misconception. And second, if we don’t focus now on the technologies that we might need to get to that zero-carbon goal, and wait until we get to 80% and start running into challenges, they won’t be there. They won’t be available. They’ll still be nascent, and they’ll still face challenges in terms of public opposition or cost or regulatory environments, and they won’t be able to scale at exactly the time that we need them. Francesca: Given your findings, what is the biggest opportunity and the biggest challenge for firm low-carbon energy resources? Nestor: I would say that… the R&D support for low-carbon firm resources and, basically, policies aiming for CO2 abatement instead of trying to increase the penetration of technologies in a specific way. Jesse: Yeah, as a concrete example of that, I think there’s been a lot of discussion in a few states and on the campaign trail in some primaries about committing to 100% renewable energy right now. We’ve had bills that were floated in the legislature in Massachusetts, for example, to legislate that. Hawaii has actually committed to that already, which I think makes a lot of sense, given the context of the Hawaiian islands and their reliance on imported diesel for basically all or most of their electricity. And then California, last session, in 2017, was considering a similar bill that would require 100% renewable energy. And that’s an increase from their current target of 50% by 2030. So they’re already committed to that. So they’re saying, let’s just keep going with renewables and we’ll just keep upping the target. And what we’ve seen in the intervening years is something really interesting, which is that, right now, California is debating not a 100% renewable bill, but 100% zero-carbon. And that small shift is really important because, as we mentioned earlier, it’s a focus on ends, a zero-carbon grid, rather than means, renewable energy. Renewables are very useful tools to get to that goal, but they’re not the only tools, and as our paper points out, there are firm resources that are non-renewable that could be very important, and there are also firm resources that are renewable that may not be receiving the same level of policy support that wind and solar have been, or certainly are not as currently economically attractive as wind and solar. So that kind of transition from a focus on renewables to a focus on low-carbon sends a really important signal that there’s an opening, a long-term market opportunity, for other resources, including firm low-carbon energy technologies. That if they could come to market, there will be some demand for them in the long-term energy system. And if we couple that with near-term research and demonstration support, as Nestor mentioned, to improve those technologies and overcome some of the challenges to scaling them, then I think we have a real opportunity to round out the rest of the low-carbon energy team. Francesca: If a listener could walk away from this podcast and repeat one thing to the next person they talk to, what would you want it to be? Jesse: I think that the main message is that wind and solar and battery storage are making dramatic progress, and that is going to fuel a lot of the decarbonization we see in the power grid over the next decade or so. But to complete the team and get all the way to a zero-carbon grid, and to do so affordably, we need to round out the rest of the team with firm low-carbon energy resources like nuclear, carbon capture, biomass, or geothermal energy as well. These are all complementary technologies. Nestor: My takeaway from this will be, climate change is a very, very complex issue, but it’s not the only one. If we could get there with a higher certainty and cheaper cost, or lower cost, then we will have some extra resources to address some other of mankind’s problems. I think that is important. Because sometimes we forget about the big picture. Climate change, again, is a very important, very complex issue, but we have so many others. Some people in this world, they don’t have healthcare access, they don’t have education, they don’t have water. If we can save that dollar to spend on one of those other problems, I think that’s worth it. Francesca: Thank you both so much for being here today. Nestor: Thanks for having us. Jesse: It’s a pleasure, thank you. Jesse Jenkins and Nestor Sepulveda of MIT discuss what the future looks like for reducing CO2 emissions in electricity, and talk about the importance of “firm low-carbon energy resources.” They also touch upon the promising energy sources available to us, and why current policies may not be supporting the full suite of resources needed to get to a carbon-free grid. Nestor Sepulveda: I was doing a Master’s in Nuclear Science and Engineering here at MIT in the Technology and Policy Program, something that Jesse and I share in our backgrounds. I had this question. Actually, one of my professors, we were talking about how you decarbonize power systems, and we were wondering how you actually determine what will be the most beneficial way of doing it. The way that will maximize social welfare. That’s how I ended up building on this for my Master’s thesis. And then, at some point, after I was done, Jesse and I were talking about the findings and we decided to move this forward, improve the experimental design, take a closer look at the assumptions that I was making, and we came up with this topic. JJ: Firm resources, which is really the focus of this paper, are technologies that can supply electricity reliably, on demand, and sustain that output for weeks or months at a time. These are really the reliable backbone of an electricity system. In today’s power system, that role is filled primarily by fossil fuels, by coal and natural gas-fired powered power plants. In a zero-carbon power system, the challenge is to replace those technologies with other firm resources that can supply that reliability and pair with variable renewable resources like wind and solar, with energy storage, demand-side flexibility, and other resources. But to do so without CO2 emissions. That includes technologies like nuclear power, carbon capture and storage, which could enable us to continue using fossil fuels but capture and permanently store the CO2 emissions. And potentially biomass, if we can harvest it at a sustainable scale or in a sustainable manner. And also other technologies that are at an earlier stage, like engineered geothermal energy systems, which would be a way to tap into hot rocks deep below the earth and harness that energy to produce steam and electricity across a wider area of the world. JJ: In our paper we present a new taxonomy to think about the role of different resources in the electricity system, in a low-carbon context, especially. Those three categories are, first, the firm low-carbon resources that we just talked about, which provide reliability and can reliably meet electricity demand at different times of the year. Then we have fuel-saving variable renewable resources, like wind and solar energy, which are variable throughout different time scales, from hours to days to seasons. But when they are available, they’re very affordable, and can help displace the use of other resources that consume fuel at a higher cost. So we dubbed them “fuel-saving resources,” because they help back off or reduce the consumption of fuels and other variable costs associated with those other resources in the mix. The final category is what we call “fast-burst resources.” These are technologies like energy storage batteries, demand flexibility, so moving around our consumption in time, or reduction of demand or demand response or curtailment when prices go very high, we might want to consume less in those periods for short periods of time. All those technologies are very well-suited to providing fast or quick bursts of power, but not sustaining them over a long period of time. They provide high-value flexibility at the times that it’s most important and most valuable, but we can’t rely on them to sustain that output over long periods of time. That’s a role best suited for firm resources. NS: One of our findings in the paper is that we see that these three different resources play a very distinct role in the mix. One of the most important findings of the paper is that even if you might be able to fulfill demand, and subject to constraining emissions, without one of these particular type of resources, the cost and uncertainty faced in order to get to that point is going to go higher. It would be like trying to play soccer with just a goalkeeper and the defenses without the midfielders. Why would you do that if you have this particular set of people or participants that are trained? They know how to play their role. NS: We see today a lot of support, but this support is usually designed to be technology-specific. What we need today is a set of policy support measures that go for zero-carbon technologies. Because we might analyze some technologies, but we don’t know what we don’t know. It might be that if you implement something that is aiming for zero-carbon, some other technology that we haven’t even spoken about will come up. JJ: That’s one of the reasons that we focused so extensively on uncertainty analysis in this paper. We model almost 1,000 different combinations of technology assumptions, about what their cost or availability, and combinations thereof. […] What we find is that the things that are robust are the sort of role of individual categories of resources, but not individual technologies. […] We really need to think about, as Nestor said, focusing on ends, not means. Focusing on the class of resources within the power system, or the midfielders and defenders and strikers on your team, rather than really focusing solely on means or specific technologies. JJ: I think one of the main misconceptions, which is what we’re trying to address, largely, with this paper, is that firm low-carbon resources are optional. That they can be substituted for by a combination of increasingly cheap wind, solar, and batteries. I think those of us who follow the energy or electricity space have probably read a dozen headlines in the last few years about how cheap batteries are the holy grail for variable renewable resources for wind and solar. If we can store the energy from wind and solar, then the variability doesn’t really matter anymore and we can rely on these resources to play a dominant role in the electricity mix, and therefore don’t need to tackle the challenges associated with trying to scale up nuclear or geothermal or biomass or carbon capture. What we show in the paper is that they’re really not substitutes. That wind and solar, as fuel-saving resources, and energy storage as a fast-burst resource, they’re weak substitutes at best for firm resources. NS: Most people think that storage will solve our problems, or that demand flexibility will solve our problems. They tend to think about that in terms of getting rid of low-carbon firm resources. But, in reality, what happens is, if I can make the system operate better, more efficiently, with demand flexibility or storage, I can do the same with firm resources. Our results show that it’s not that you get some value from demand flexibility or storage only when firm resources are not there. You get value out of them when firm resources are there as well. In some cases, you might get even more value than if you only have solar, wind, and storage. JJ: I think that the main message is that wind and solar and battery storage are making dramatic progress, and that is going to fuel a lot of the decarbonization we see in the power grid over the next decade or so. But to complete the and get all the way to a zero-carbon grid, and to do so affordably, we need to round out the rest of the team with firm low-carbon energy resources like nuclear, carbon capture, biomass, or geothermal energy as well. These are all complementary technologies. NS: Climate change is a very, very complex issue, but it’s not the only one. If we could get there with a higher certainty and cheaper cost, or lower cost, then we will have some extra resources to address some other of mankind’s problems. I think that is important. Because sometimes we forget about the big picture. Climate change, again, is a very important, very complex issue, but we have so many others. Some people in this world, they don’t have healthcare access, they don’t have education, they don’t have water. If we can save that dollar to spend on one of those other problems, I think that’s worth it.